BUSY SPUR TRACKS Need Better Protection. Use SideKick Derail Booster wherever additional derailing capability is needed. SideKick is especially useful in curved track where the derail has to be located on the inner curved rail. In such a situation, by placing the SideKick on the outer curved rail, the derailing capability is enhanced. SIDEKICK for Hinged Derails on wooden ties. 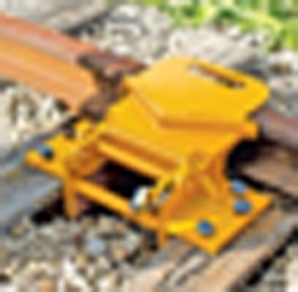 When used with a hinged derail, a SideKick increases the likelihood of effective derailing because wheels on both rails will be guided off and into the ballast. SIDEKICK Derail Booster must always be used with a derail. It cannot derail by itself. The booster should only be used with an Aldon brand derail. SideKick is installed opposite a hinged derail on the same two ties. Like a hinged derail, SideKick folds down between the rails when not needed. In operation, the worker first throws the hinged derail onto its rail. He then steps over and flips the SideKick flange onto its rail. Worker must ensure that the derail and the SideKick are both in the same position (on or off the rail) at all times. Each unit can be padlocked on or off the rail. Derail boosters come in four sizes, each of which fits a small range of rail heights from 80 to 141 lbs/yd.